It has been a very busy week, but I did manage to put a little paint down. 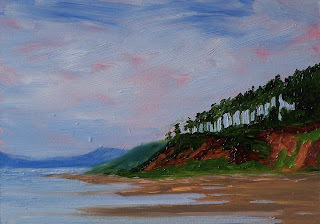 This little 5 x 7 oil painting is inspired by a trip to the Washington State Coastline. The way the wind sculpted the trees at the top of this high bank captured my attention. This was an exciting weekend. I travelled to Oregon State to watch a cross country meet. There were hundreds of runners at the Seaside 3-course Challenge. Those runners ran through some amazingly tough terrain. I admire their guts and stamina. The day was abosolutely beautiful and just the right temperature for running. 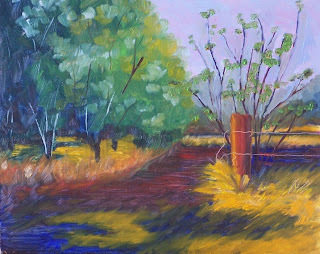 Today's painting was inspired by some of the landscape at the starting gate. It is an 8 x 10 oil on gessoed hardboard. It was so much fun to paint, I started a larger version of it and hope to have it finished before too long. 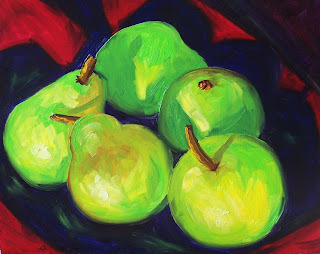 This 8 x 10 oil painting on gessoed hardboard was so much fun to paint. 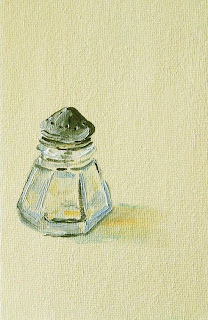 I was trying to paint loosely and capture the sunlight that shone on this little group. My palette consisted of French Ultramarine, Quinacridone Violet, Thalo Yellow-Green, Cadmium Lemon Yellow, Cadmium Yellow Medium, a touch of Parylene Red and Titanium White. Here is another seascape I've worked on recently. 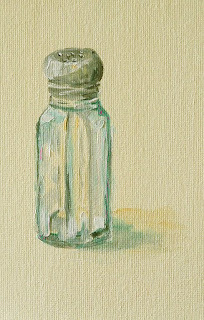 This one is 5 x 7 inches on gessoed hardboard. These little scenes require more time than most paintings I create because I have to let the painting of the rocks dry before I can add the splashing water that cascades over them. It takes a week for each layer to dry. I have several half finished paintings waiting for additional work. 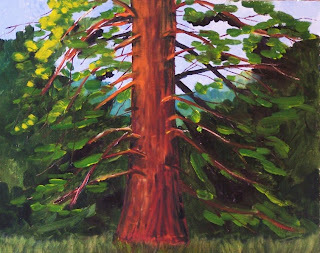 This is an 8 x 10 oil painting of a giant cedar tree in Pt. Defiance Park located in the city of Tacoma about 30 minutes south of Seattle, Washington. There are numerous old growth cedar trees in the park that have been growing for hundreds of years, long before the area was populated and before the park was authorized by Grover Cleveland in 1888. Old growth forest, saltwater beach frontage, a zoo, an aquarium, and beautiful gardens are encompassed in the 702 acre park. I love to go there to look at the gardens and walk along the boardwalk that fronts some of the tidelands. I took a snapshot of this tree the last time I visited the park. Its red bark and extreme heighth caught my attention. I tried to capture some of my resposes in this painting. 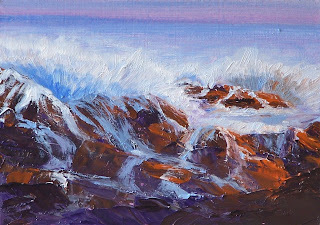 I've been working on this 8 x 10 oil painted seascape for a few weeks. 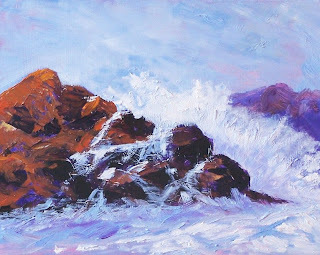 The splashing water and slippery rocks of the Pacific Coast capture my interest. Leaning to recreate the glint of sunlight and the cold shouting of the tide is definitely a challenge. I may not be finished with this one yet; I'm going to let it sit for a while before I decide it is finished. 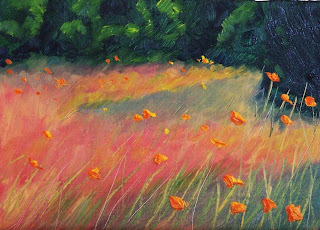 This 8 x 10 oil painting on gessoed hardboard is based on a photo I took last fall. 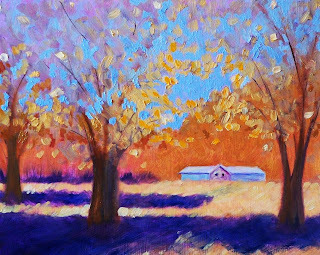 I loved the golden leaves, the way the sun sparkled on the house, and the deep color of the shadows. Crisp fall days are great for a walk in the park. 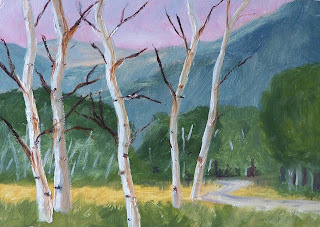 This 8 x 10 oil painting on gessoed hardboard is based on a recent jaunt that I took at one of my favorite parks. An old fence post still holding on to some rusty barbed wire caught the sun; the grass was golden, and the weather was delightful. Summer is the time for fresh fruit. 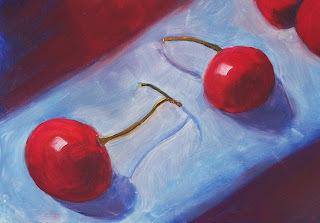 I painted this little 5 x 7 oil painting on Gessoboard just when the cherries came into season this past summer. As the door closes on summer I hate to say goodbye to the fresh fruit of summer. No more cherries, no more nectarines, no more watermelon, no more wonderfully fresh summer fruit. 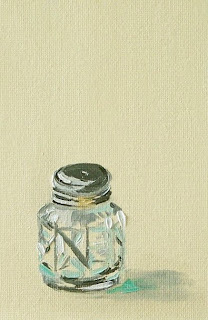 I will miss it terribly, but the wonderful seasons to come will bring new delights and new things to paint. I hope you will be able to join me on my painting journey. You can subscribe to my blog through e-mail or an RSS reader. Links for either method are on the top right column. Please join me for future painting adventures. I look forward to your visits. 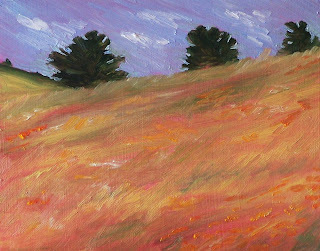 This little 5 x 7 oil painting brings fall to the forefront. Trees lose their leaves, the grass is turning gold, and the air is cooler. Taking walks this time of year is exhilarating.